There are a few good reasons to maintain an organized medicine cabinet, not the least of which is to simplify our lives and make it easier to find the things we need. Another important reason to keep our medicine cabinets in order is to make sure we’re not holding on to any expired medications.Medication errors, ranging from incorrect prescriptions to taking expired pills, injure in excess of 1.5 million people annually. Here are five things you can do to de-clutter your medicine cabinet and ensure that doesn’t happen to you. Start from scratch and clear out the entire medicine cabinet. Throw away anything that is damaged, useless, and most importantly, expired. This article from the Food and Drug Administration talks about the dangers of taking expired prescription drugs. Next, clean the shelves with disinfectant wipes or a sponge and disinfectant spray. If you are able to remove the shelves, take them out, wash them in soap and water, and thoroughly dry before replacing. If your medicine cabinet shelves are adjustable, move them up to create more room for the tallest items, such as cologne, hair gels, and toothbrushes and toothpaste. Putting your toothbrush behind a closed door is more sanitary than leaving it out on the counter. Another great way to maximize space is to invest a few dollars in mini risers. They add an extra shelf to the medicine cabinet, which allows you to neatly store more items. As you return the items to the medicine cabinet, pay attention to where they go. Anything you don’t use often should be placed on the top shelf, or even in another cabinet. For example, how often do you really use hydrogen peroxide? Save the lower shelve(s) for everyday items. Anything you buy in bulk, such as cotton balls, should be moved to smaller containers with the big bags being stored separately. Place the items in uniform clear jars for ease of identification, place them in the medicine cabinet, and refill as needed. This prevents everything from tumbling out of the medicine cabinet every time you open the door. If it’s feasible, do the same thing with liquids, like hair gel. When it comes to items that are already small, consider consolidating them into a single clear jar. For example, group together your lip balm, eyeliner, mascara, and lipstick. That way, nothing will roll out of the medicine cabinet, but you can still easily retrieve the items. To make it easier to find everything once it’s all been organized, group things together by category. All of your makeup should have its own area, as should all of your first aid supplies, medicines, hygiene products, and so on. That way, when you open the medicine cabinet looking for something, you don’t have to move everything around (disorganizing it again!) just to find it. 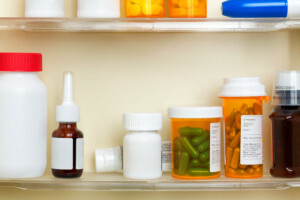 Keeping an organized medicine cabinet can save you time and help you avoid frustration. It can also serve as a reminder to keep track of the dates on your medications, so you can throw them out once they’re expired. If you need to get rid of old medication, but don’t know how to safely dispose of it, read this article from the FDA, because while it is important to dispose of expired medication, it’s also important to do it properly.